The NES version of Double Dragon III: The Rosetta Stone (spelled with a roman numeral), unlike the arcade version, was developed in-house by Technos Japan rather than East Technology. Both versions of the game were also developed in tandem. 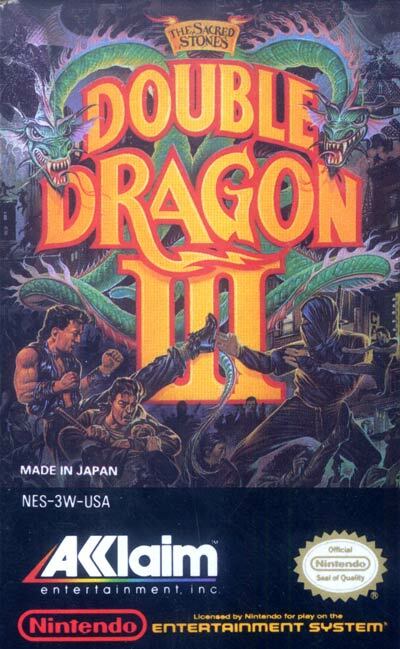 The English-language version was released in North America and Europe by Acclaim Entertainment and was retitled Double Dragon III: The Sacred Stones. While the NES version is an adaptation and not an exact port like the previous NES installments, the NES version has a completely different look than the arcade game, featuring different enemy characters and stage designs.